Today, I am pleased to interview my good friend Gretchen Preston, a fellow U.P. 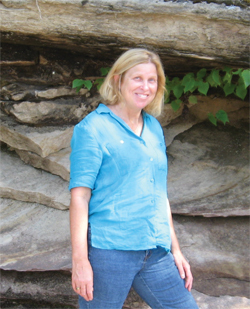 author, who has written the Valley Cats series. Gretchen is a native of Portland, Oregon. She grew up in a two-parent family with three brothers and one sister. After graduating from the University of Oregon, she went on to graduate school at Arizona State University where she earned a Master’s in Social Work. She worked in Denver, Colorado as a medical social worker on an organ transplant team for many years. Gretchen met her husband Tim, a local Marquette businessman, in April of 2000, when he was visiting a mutual friend in Denver. 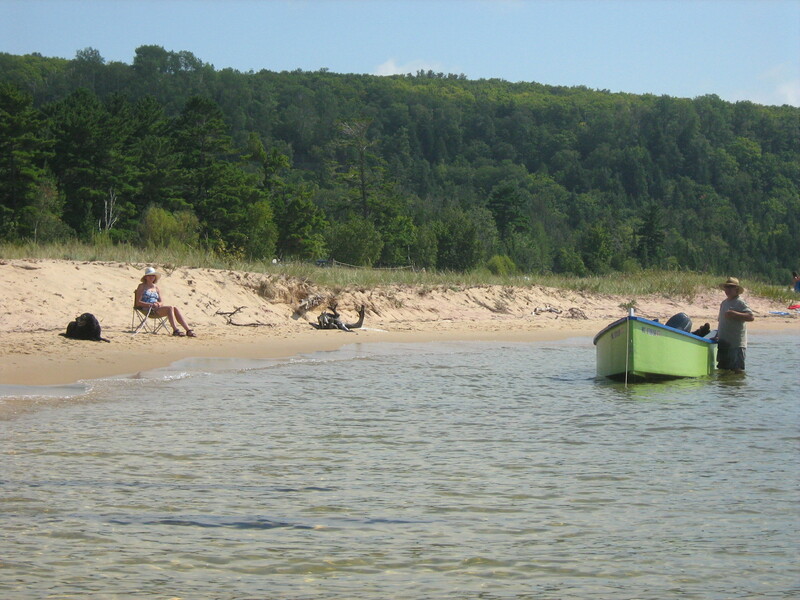 They married in 2001 and Gretchen relocated to the Upper Peninsula of Michigan. After retiring from social work, her goal was to become a published author. Tyler: Welcome, Gretchen. Let’s get started by your telling us a little about the Valley Cats series, beginning with the two main characters. What can you tell us about Boonie and River? Gretchen: Boonie and River are two housecat adventurers. The stories are set in our U.P. backyard. Boonie is the older and wiser cat. He is an experienced outdoorsman. After all, Boonie was named after the human, frontiersman, Daniel Boone. River is more timid. His over-protective mistress doesn’t allow him to wander. The cats meet at the Valley pet parade one summer afternoon. After joining forces, the new friends proclaim themselves the “Valley Cats.” The short stories wind their way through the U.P. seasons. The cat-pals go on many adventures including; taking a walk in the winter woods, exploring a shoreline cave and stowing away on a fishing boat. The stories are spun with humor and a gentle style making the text entertaining to kids of all ages. Boonie and River learn about friendship, experience the death of a friend, and trip over life’s hazards. Currently, there are two completed books in the Valley Cat series. “Valley Cats: The Adventures of Boonie and River is 103 pages. It is the first book in the series. 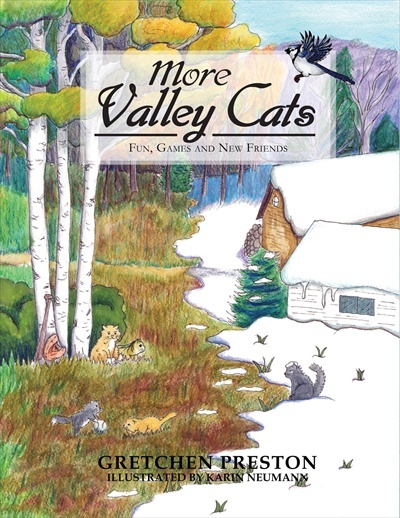 The sequel, “More Valley Cats: Fun, Games and New Friends” is 143 pages. The hardcover books have 14 fun-filled chapters. Each short story is accompanied by a Karin Neumann full color illustration. The books do not need to be read in order. The second book picks up where the first book left off. The characters and setting are re-introduced for new readers. Tyler: Rather than writing a full-length book, you’ve written several stories in one volume. What is the benefit of that in your opinion? Gretchen: Full-length books are intimidating to new readers. Short stories are more accessible. Chapter books are more reader-friendly. We all remember when we advanced from reading primers to chapter books. The chapters stand alone and do not need to be read in order. The colorful illustrations rouse interest in the accompanying story. Children can browse through the books and choose a story which attracts them. The Valley Cat books are written at a fifth grade reading level. Although, accomplished second graders are enjoying the books. Written and punctuated to be read aloud, my books are perfect for lap-time with your favorite child as well as bedtime reading. Tyler: How is the second book More Valley Cats different from the first one? 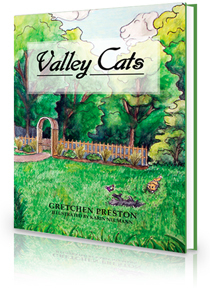 Gretchen: “More Valley Cats: Fun, Games and New Friends” is forty pages longer. The inside cover is decorated with a map of the Valley enabling readers to follow along with the action. Like the first book, it has a glossary in the back pages making it easy for young readers to look up unfamiliar terms. New characters join the Valley Cat fun when Buddy Boy is adopted from the animal shelter by Big Tim to rid his boat shop of mice. River struggles with accepting a new cat-sister into his family. A batch of orphaned kittens is found in the woods when the Valley Cats are searching for a lost softball. The introduction of these new cat characters expands the Valley Cat antics. The older cats teach the kittens about life in the Valley, the kittens explore their world and relationships become more complex. The cats learn about jealousy, and how to share. Boonie, River and Buddy learn the consequences of knowingly breaking the rules when they venture into the forbidden boat shop. New settings are introduced when Boonie and River tag along on a hike over the ridge where they have never gone before. Little did they realize their adventure would take place in a leaky boat! New friends come to the Valley. Two new human characters are introduced. When a blind professor moves into the vacant house, Boonie learns about blindness. Danny the prankster comes to visit and the cats learn about jokes from the teenage boys. Tyler: I’m a big fan especially of how you’ve introduced U.P. natural history, places, and culture into your children’s books. Will you give us some examples of what you consider educational moments in your books? Tyler: How did you first get started writing the Valley Cats series? Gretchen: I made up the first few stories when my five year old friend asked me to tell her a story. Boonie is her cat and River is a neighbor’s cat. I just started spinning a tale about two cats who were adventurers. I used activities that my young friend and I had done when we played in our Valley through the passing seasons. These became the first Boonie and River adventures. I use my life in the Valley as storylines. My characters are my real neighbors and animal friends. The stories write themselves, through me. Tyler: So the Valley is a real place? Where is it? And how do your neighbors and friends feel about being included in your books? Gretchen: The Valley lies in the hills which rise gently above the south shore of Lake Superior. Valley Road is a half mile dirt road with only a few family homes. It empties into the deep woods where several of the Valley Cat adventures take place. The actual location is in Chocolay Township, but my setting can be anywhere in the Upper Midwest…wherever your imagination takes you! The Valley Cat series chronicles our life as neighbors. The Valley children do not age as fast in my books as they have done in real life. The stories stop time in a sense. The children of the Valley will always be kids amongst the pages. They are all looking forward to reading “their stories” to their own children someday in the future. It chronicles their childhood, a hardbound diary of our time together. The Valley neighbors are very much a part of my story creation. When I get a storyline idea, I consult all of the human characters. I meet with them and we chat about my idea for the story of which they are a part. I always use real life storylines. I am really not that creative; I just live in a cartoon and write about it! I ask questions to fill in my story ideas. Then, get their verbal permission to create the story. I balance the stories between the characters in hopes that each real life character has his or her “Moment” to be a main character. Of course, for the minor children, I discuss it with both the child and the parents. Before the books go to print, all the human characters are given a final draft of the story for approval, and have the opportunity to view the accompanying illustration in which they are characterized. After they have read and approved the story, I have them each sign a legal release form giving me permission to use their name and character likeness. I am totally respectful of my characters’ privacy. There are two characters who did not feel comfortable with me using their true-life likeness, so, Karin used another person’s image for that character’s illustration. In only one case a character did not feel comfortable with me using his/her real name. We compromised on using that person’s middle name for the character’s handle. My neighbors think that it is fun to be in the books. It gives them a sense of local stardom. My readership is always thrilled to meet the “real” characters and have their book signed by them. I have some really funny stories about my Valley Cat characters being recognized in public. Honestly, I have more problems of not adding new characters. Everyone wants to be in the books. I am leery to add too many new characters. I think too many characters gets confusing. It is my intent to concentrate on developing the existing characters and limit new ones. Tyler: Tell us about the illustrations. How do you and illustrator Karin Neumann work together? Gretchen: I send Karin my story rough drafts as I complete each story. We discuss what would be the most appropriate illustration for each short story. Sometimes we have to compromise to accommodate printing requirements. Each story has one full color illustration. Black and white illustrations are placed on pages to fill empty space. We design the horizon covers together. It takes good communication between author and illustrator to be successful. Illustrators cannot read the author’s mind, so I must be very clear when I am describing my vision for her drawings. Karin and I are partners. We have great respect for each other and have developed a warm working relationship. Tyler: Gretchen, I know you are visually impaired. Will you tell us about your low vision and how it affects your writing process? Gretchen: I have a juvenile onset form of macular degeneration. I had normal vision until the fifth grade. I still have some useable sight, but I do not see well enough to have a driver’s license, read street signs or access printed materials. I do my writing on my laptop computer which is equipped with a low vision software product called, “JAWS.” This stands for “job access with speech.” It talks to me while I type. With special keystroke commands I can read my documents by letter, word or line. I have found these features very helpful when pacing my story. It is easy for me to hear when a sentence needs to be edited. Hearing the words helps my flow and makes my stories easy to read aloud. I had the opportunity recently to be interviewed for a podcast regarding my low vision and how it affects my world. For those who are interested, visit http://www.freedomscientific.com/FSCast/episodes/fscast065-april2012.asp. It is podcast #65, April 2012 with Jonathan Mosen. Tyler: You often visit schools and give presentations to children. What do you find fulfilling about those events? Gretchen: I have hosted Young Authors programs in Marquette County the last two years. I have been a presenter at school career days and was awarded a “Home Town Hero” award at one local school. The students are thrilled to meet a “real” writer. It’s really fun to hear their reviews of my work. They make me feel like a super star. The Valley Cats are developing a fan base. Kids are already clambering for the next book. I donate a fair amount of books to school and public libraries. It is not always about selling books. My books are timeless and my fan base is being refreshed on an ongoing basis. I want kids to identify with my characters and the situations they encounter. Some of my stories are just for fun and others have life lessons or educational components. Too much learning and not enough just plain fun will not keep a young reader’s attention. So, I mix it up! The most fulfilling part of writing children’s books is the feedback I get from the kids, their parents and teachers. I had a mom buy a book for her disabled son at a book signing. She told me that her son had checked the first Valley Cats book out of the public library three times and was always reluctant to return it. She grinned when she told me how thrilled her son would be finally to get his very own copy. It is these moments that make me forget the endless hours of editing, production headaches and my financial outlay. Tyler: Do the children give you many ideas for your books? Gretchen: I have a “child editor.” Each story is proofread in early rough draft form. I get feedback from a kid’s perspective. My child editor has given me great ideas and feedback. I always ask young readers what is their favorite story and why. I am pleased that so far, each story has its fans. This leads me to think that my stories have something for everyone to enjoy. People often tell me stories about their own cats. Occasionally they will ask me to write them a story about their pet. I have a collection of “Cat Tales” which will be published in the future. I get my ideas for the Valley Cats stories from actual events that have occurred in our Valley. I do stretch the truth a tad. Tyler: Gretchen, I know you’re busy working on the third book in the series. Can you give us a little preview of what it will be about? Gretchen: “Valley of the Cats: Earth, Wind and Sky” is filled with Earth science. Old friends return to the Valley and the whole gang goes boat camping on Grand Island. Chapter One is “Snowflakes in the Mirror.” It is a story about the concept of infinity. In another story, “Hippie Hollow” the cats happen upon a music festival in the woods. Illustrations include the Northern Lights, cumulous clouds and the Lake Superior shoreline. Tyler: Gretchen, will you tell us about your website and where else we can find copies of the Valley Cats books? Gretchen: My publishing company is Preston Hill Press. Books and illustration prints can be purchased directly from my website, www.prestonhillpress.com. Book sellers are listed on my “Where to Buy” page. I prefer to have my books placed at independent bookstores and gift shops. I have placed books for sale at places where kids frequent, The U.P. Children’s Museum, the Marquette Maritime Museum and ice cream stores. I have also placed my books at non-traditional book selling locations, including veterinarian offices and pet stores. I have books offered as “thank you gifts” for our local National Public Radio station fundraising events. Valley Cats books are available throughout the U.P. 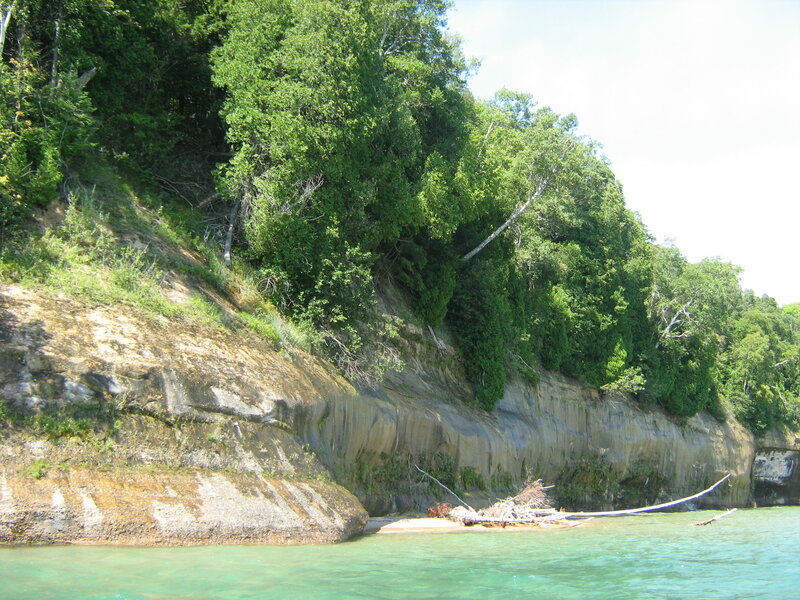 and northern Michigan. 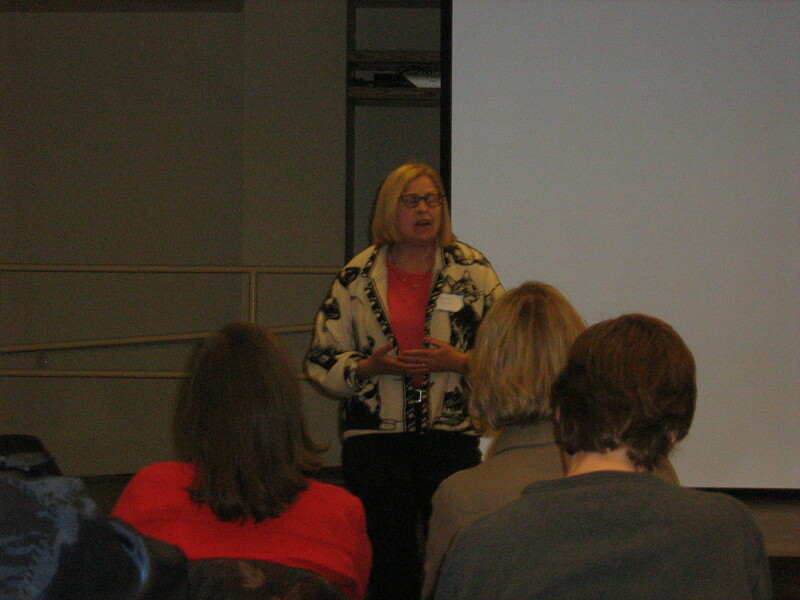 Gretchen Preston speaking at the U.P. Publishers and Authors Association Conference April 2012, and wearing her cat jacket. Tyler: What if people want to meet you in person? Do you have any events you’ll be attending this summer or Christmas season? 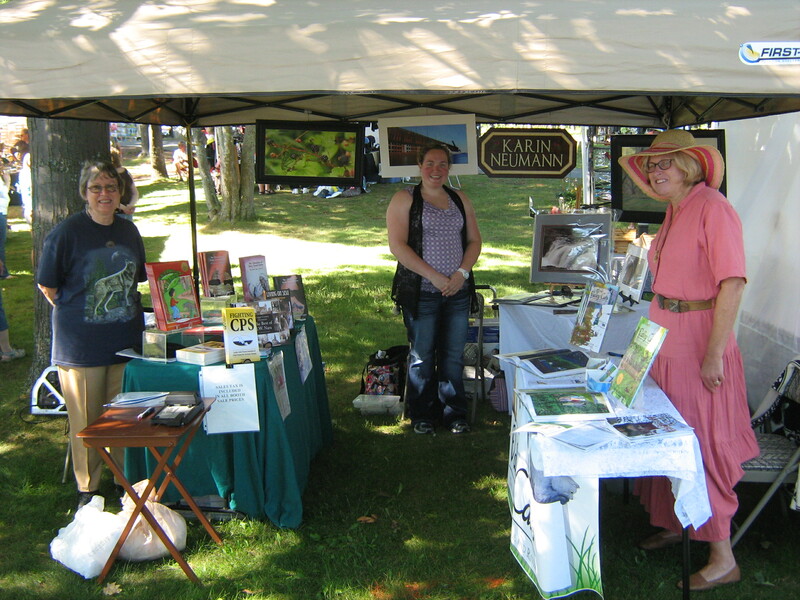 Gretchen: Both Karin Neumann and I will be at the Outback Festival in Marquette the last weekend in July. I am currently negotiating appearance dates in June at the Moosewood Nature Center on Presque Isle. 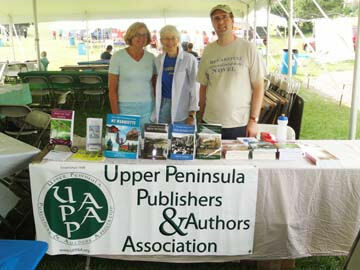 There may be opportunities for UPPAA members to sell books in Michigamme at their summer farmer’s and artists markets. No dates for their markets have been announced, but I will let everyone know the upcoming dates and times. 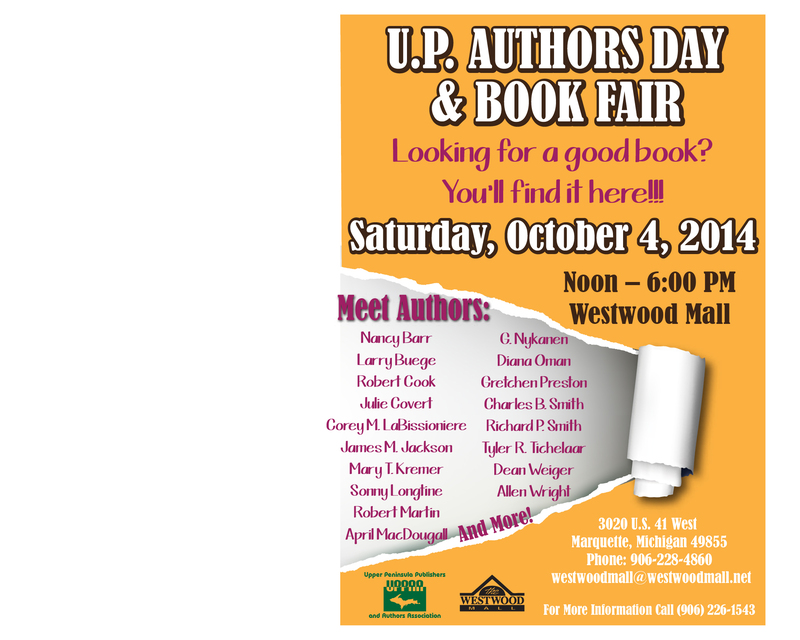 I will be in Curtis selling books with you, Tyler, at their Art Fair on September 1st. Karin and I both plan to be in attendance at the WLUC TV6 Holiday Crafts show the first weekend in December in the Superior Dome in Marquette. Consult our “Coming Events” page on the website where appearances are posted. The list is updated as appearances are confirmed. I am always willing to talk about or sell books. I donate to silent auctions and community fundraising events. I can be contacted via email at prestonhillpress@gmail.com or by telephone at 906.360.7608. My summer goals include producing the Valley Cat series as a CD. It will be locally audio recorded. Additionally, the books will be produced in Braille for blind children. We are also discussing converting them into an e-book. Tyler: Thank you, Gretchen, for the interview. It’s been a real pleasure. I’ll be looking forward to reading that third book. Gretchen Preston’s Valley Cats: The Adventures of Boonie and River is the fun and adventurous story of two cats who first meet during a pet parade and quickly become best friends. Boonie is a bit more daring than River, who is not allowed to leave his yard, but soon Boonie convinces River he can get the trust of his mistress so they can have adventures together. Those adventures happen in the Valley where Boonie and River live, as well as the surrounding areas of their Upper Michigan home. Preston based the story upon people and cats she knows, and the Valley is inspired by her Chocolay Township home in the woods just outside Marquette. Boonie and River are characters children will love—especially cat lovers. They are reminiscent of characters in earlier children’s books about friendship such as Arnold Lobel’s Frog and Toad series although Valley Cats has more in-depth stories with full length chapters, each one telling the story of a Valley Cats adventure. The adventures include exploring the outdoors during the winter, visiting a bear cave at Broken Indian Rock along Lake Superior, a rainy day picnic, playing “Rodeo Cats” which includes jumping on dogs who act like bucking broncos, stowing away on a fishing boat so they can pretend to be pirates, and playing in the bathroom sink on a snowy day. Although the Valley Cats occasionally get in trouble on their adventures, they also strengthen their friendship and make new friends with other animals and humans along the way. The stories are visual, so while the reader can follow the action without any trouble, the gorgeous full-color illustrations by Karin Neumann provide an added dimension to the stories. These watercolor pencil drawings are brightly colored to attract children, but adults will be stunned by how perfectly Neumann captures not just the charm of the cats and the story, but the shadows of trees on the snow, the evening sunset and the humor and sadness—all the emotions and tone—of the story. Besides simply being a fun read, Valley Cats is an educational experience for children. One story encompasses the death of a family pet which may help children relate to and understand death. Other stories highlight the outdoors and read almost like educational field trips. Preston includes a glossary of terms at the book’s end for young readers as well as those less familiar with Upper Michigan culture. Words included in the glossary include “fire circle,” “Ojibwa” and “zucchini.” Children from third to fifth grade will most enjoy this book, but it also works well as a read-aloud book for younger children, and adult readers will appreciate the humor and the stories’ gentle tone. Preston, a native of Portland, Oregon, fell in love with children’s stories while her parents read to her at bedtime. Although her career aspirations led her to obtaining a master of social work degree, she credits her writing prowess to learning to write in graduate school. Trained as a medical social worker, Preston frequently wrote newsletters, professional journals and composed educational handbooks. After retiring and moving to the Upper Peninsula, she had the opportunity to begin writing children’s books. Valley Cats is the first book in a series about Boonie and River that she has planned. Because the characters were largely inspired by her Valley neighbors, Preston dedicated this book to them. Illustrator Karin Neumann was raised in Traverse City and received a Bachelor of Fine Arts from Northern Michigan University. While living in Marquette, Neumann met Preston and was commissioned to illustrate Valley Cats. Inspiration for each illustration came from the interaction of the characters of Boonie and River, as well as Neumann’s observation of her own cat and the barn cats she had growing up. 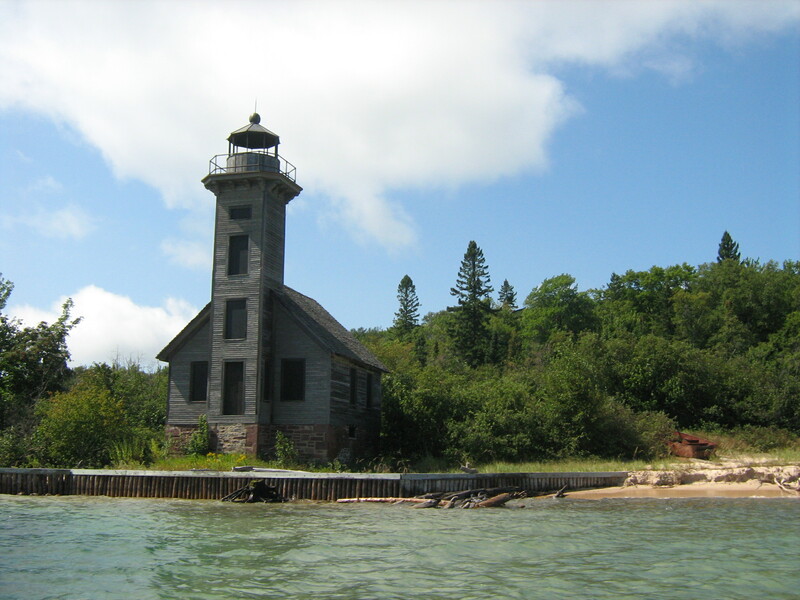 She took photographs of the various locations in the book, from the woods to the Lake Superior shoreline. She then used the photographs as inspiration to draw the illustrations. Full-color prints of the illustrations are available for purchase at the book’s Web site. Preston, who has fallen in love with her new Upper Michigan home, believes in supporting the local economy so she wanted the book produced within the state. Besides hiring a Michigan resident as her illustrator, she also has had the book printed in Michigan and has hired Michigan people to help promote it. She is proud to say that Valley Cats is a “Pure Michigan” product. As an adult without children, I still found Valley Cats to be a true pleasure to read. It not only made me laugh and smile, but I marveled over the stunning illustrations, and many fond childhood memories came back to me of my own favorite illustrated children’s books such as Maurice Sendak’s Where the Wild Things Are and James Marshall’s George and Martha books—the books that first made me fall in love with reading. I have no doubt that Valley Cats will have a similar magical effect upon many children. All summer, my friends Tim and Gretchen Preston have been telling me that they will take me on “the boat ride of my life.” But the weather kept stopping us until yesterday, Sunday, August 22nd, when we had perfect weather. With a cooler of chicken, vegetables, and molasses cookies, Rosie the dog, a camera, and an intent to enjoy the beautiful summer weather, we embarked in Munising Bay and made our way to Grand Island. We waded on the beach, played fetch with Rosie, then floated above the 1870 shipwreck of the Dreadnaught, visited the old Coast Guard station along the mainland, and admired the old lighthouse on Grand Island. We couldn’t have had a more beautiful day. 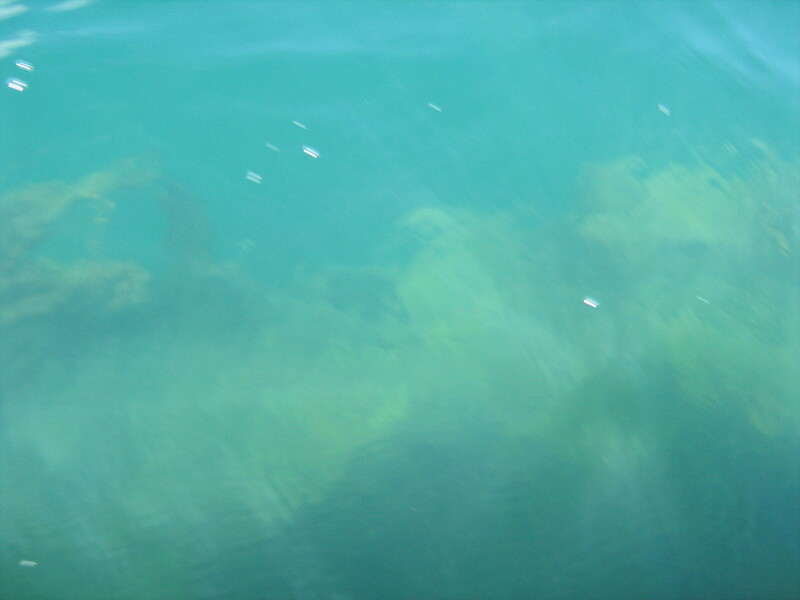 For those of you not fortunate enough to be out on Lake Superior, here are a few pictures. My favorite part, aside from the good company, was admiring the gorgeous cliffs of Grand Island, the colors of which are as rich as an oil painting, and complete with dribbling little waterfalls. Tim, by the way, is involved in building the longboat for Founders Landing–he actually built the boat in which we had our adventure–and Gretchen is the author of the newly published children’s book “Valley Cats.” For more about her charming new book, visit Preston Hill Press. Summer isn’t over yet. Go out on the lake while you can and enjoy August as Maritime Month!